I got on the Nutella bandwagon in high school, when my German teacher served it to us on slices of sourdough baguette. Is it just me, or does food taste about 100x better when your teacher hands it to you in class? 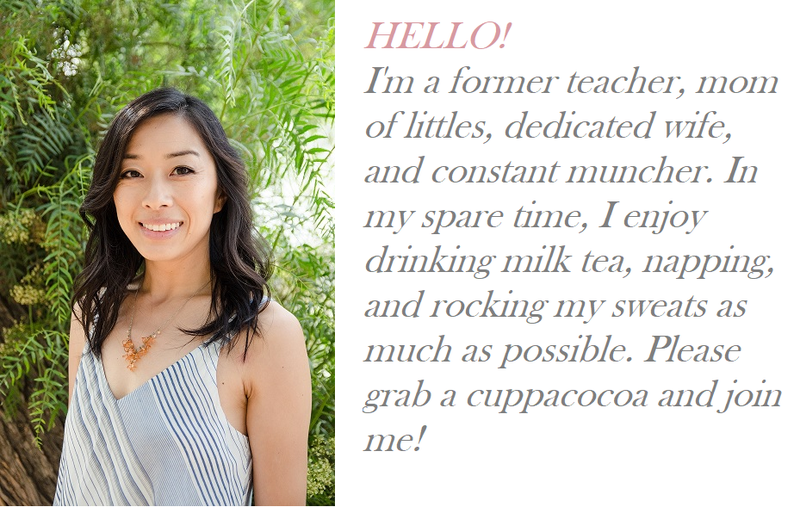 Doesn’t matter if it’s goldfish in third grade or chocolate spread on bread in high school– it’s such a treat! As odd as the combination might have seemed in any other context, it was like magic that chilly morning in third period. Chocolate spread on bread?! That’s allowed?! I thought. That seriously might be the most lasting thing I took from that class (my teacher was great, but honestly, I’ve never used my German since). Since then, loads of people have fallen in love with the stuff, and for good reason. Here is one of my favorite applications of Nutella: Banana Nutella Croissants. Guys, these are SO GOOD. I want them ALL THE TIME. I think I first saw Giada make these on Food Network, but I can’t seem to find her recipe online. All I know is the freshly-married young JoEllen immediately set out to Safeway, picked up croissants and bananas, and put her new panini grill to work. The result was glorious: We bit into those crisped, buttery, flaky croissants only to meet a burst of warm, oozy nutella with nuggets of warmed banana slices rounding out the sweetness. HEAVENLY. I’ll be the first to say that these don’t make for the prettiest presentation… but it doesn’t matter. Whip these up in front of your friends and when they smell the buttery croissanty nutella goodness, the only thing they’ll be thinking of is biting into one of these delectable treats. Try it, and tell me you didn’t love it! Preheat your panini griddle to a medium-high setting. If you don’t have one, preheat a nonstick pan to medium high heat. Assemble your sandwiches: Cut each croissant in half, like a sandwich, and spread a thin layer of Nutella on the inside of both sides. Don’t overdo it– you’ll get plenty of sweetness. Add one even layer of bananas and close your sandwich. Lightly spray the outside of the top and the bottom of the croissant with cooking spray, then place on hot panini grill. Close, and let heat until golden brown and crisp on the outside. If you are using a nonstick pan, then place croissant into preheated pan and place a flat, heavy lid on top to smush it down a bit. Let it heat until crisp, 1-2 minutes, then flip and repeat. Cut in half and serve immediately! Yummmyyyy!!! Spray cooking spray into a frying pan. Smush down the sandwich with another pan that is smaller!! Don’t need a panini pan at all! Yes, that is totally another way to make crispy sandwiches! But you know. 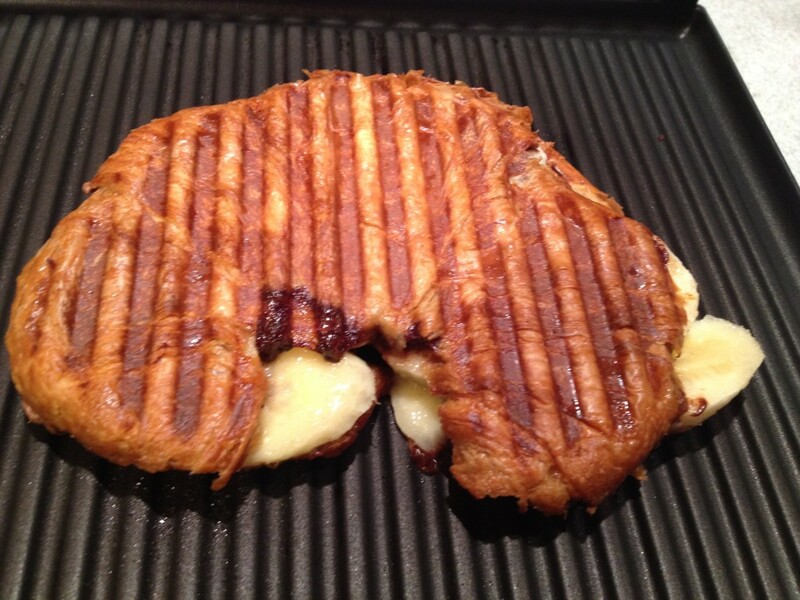 If you happen to have the panini pan in the pantry… why not? :). Fun stripes make for nice presentation? :). It’s cool I get you ;). Lately many other spreads traying to compete with Nutella have come on the market. Try one of those as a replacement! Reeses has one and so does Hershey! Ooh! Good idea! I will keep an eye out for those :). Although I gotta be honest, Nutella has a nostalgically specially place in my heart thanks to my high school teacher =). Oooh, that looks so good! And I’m so sad I can’t eat it! (I’m allergic to the hazelnuts in nutella. 🙁 ) But seriously… chocolate + banana + yummy flakey croissant = yum. Sounds interesting and easy to do, I might try that next time we have some nutella. Yes, do! And let me know what you think! Ooh, do you add ice cream to your banana split? But really, chocolate + bananas = win.